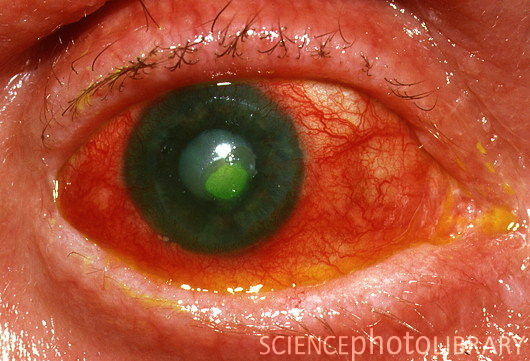 Corneal ulcer. Close-up of the eye of an 80-year- old woman showing severe inflammation caused by a corneal ulcer. The location of the ulcer is shown by the green fluorescein dye. The cloudy colour of the pupil is caused by a mature cataract (opaque lens) that had caused loss of vision in the eye prior to development of the ulcer. A corneal ulcer is an infected break in the surface of the eye that fails to heal and becomes inflamed. The condition is caused by injury or infection and is very painful. Treatment depends on the infectious agent present; bacterial ulcers are treated with antibiotics, for example.